The Teaching Resource is developed from research materials associated with the exhibition Rastafari in Motion. The project's journey began in early 2012 when Ras Danijah Tafari, a Jamaican resident in Ethiopia, introduced an upcoming exhibition in Addis Ababa to the UK community, entitled Ras Tafari: The Majesty and the Movement. The exhibition would bring together remembrances and artefacts from His Imperial Majesty Emperor Haile Selassie I connections with global communities. The Rastafari community in the UK was invited to contribute to this event and a committee was duly established for this purpose in July 2012. Known as the RMM(UK) Committee, early core Directors consisted of Ras Danijah, Ras Cos Tafari, Sister Stella Headley. 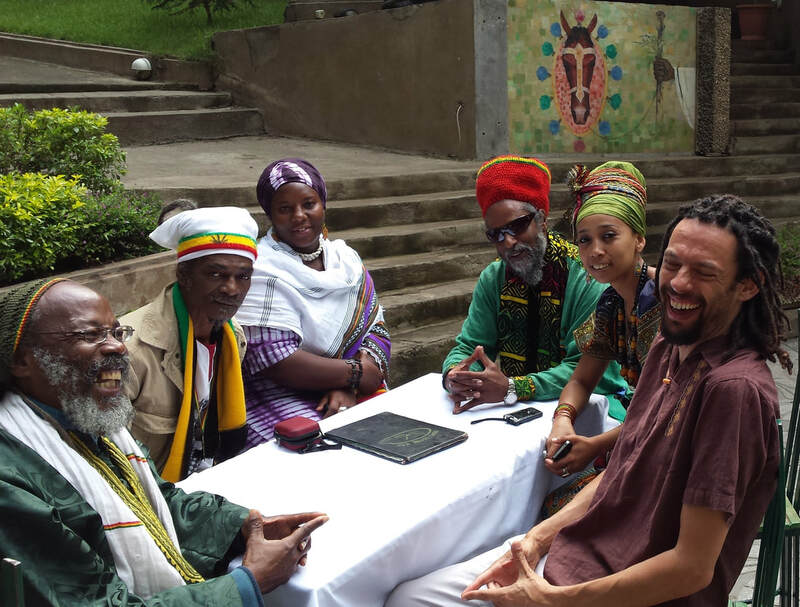 Ras Lionwyze, Dr Robbie Shilliam, Jah Blue, Ras Shango Baku, Ras Ray‐I and Sister Addishiwot. The Ethiopian Exhibition, launched on May 25th 2014 at the National Museum of Ethiopia in Addis Ababa, was an unqualified success. In the opening address Exhibition Director and Curator Dr Desta Meghoo made special mention of the UK contribution, as did others who showed their appreciation for the focus, content and quality of the RMM(UK) panels. RMM(UK) members addressed delegates at the accompanying exhibition international Colloquium, outlining the research process and revealing some of the archived documents that had been recovered from a range of British institutions. .In October the exhibition was invited to the Guildhall in Bath to commemorate the 60th anniversary of His Majesty being given ‘The keys to the City’. The exhibition was then displayed at the Bath Library for two weeks before being installed at Fairfield House in time for a ‘Golden Sabbath’ coronation grand opening on November 2nd, where it was the centrepiece of the annual celebrations of the Coronation of His Imperial Majesty Haile Selassie I on Nov 2nd, 1930. In February to March 2015 it was featured at The Drum in Birmingham where three accompanying presentations/discussions were hosted on 23rd & 26th February and on the 19th March when the first film produced by Rastafari Regal Livity entitled The Magdala Campaign was given its debut showing to the gathered audience, celebrating the life and works of Ras Seymour Maclean. April 2016 signalled the 50th anniversary of His Imperial Majesty Haile Selassie I's visit to the Caribbean. As part of the celebrations to mark this momentous occasion, the Rastafari The Majesty & The Movement (UK) exhibition was invited to the Montego Bay Cultural Centre, courtesy of the Institute of Jamaica. The grand opening on April 15th was attended by the Rastafarian community and local Dignitaries, including the Mayor of Montego Bay CLLR Glendon Harris JP. The ‘Rastafari Indigenous Village’ members blessed the opening presentations and sealed the evening with Nyahbinghi chanting and praises. We acknowledge the Curator Dr Kim Harris for the inspirational role she played and all the staff at the Montego Bay Cultural Centre. Re‐titled Rastafari in Motion, and having been transformed with a brand new expansive treatment, the Exhibition opened on Tuesday 14th June 2016 at the Black Cultural Archives and has proved much more than a mere collection of panels recording His Imperial Majesty’s crucial years in England and the evolution of the Rastafari movement in Britain. The broader reflections on international morality, equal rights and justice and the Ras Tafari way of life, have taken the exhibition far beyond its original scope, intent and purpose. For these reasons, core members of Rastafari Regal Livity have turned the research for the exhibition into a teaching resource for students at school and students of life in general.